Porsche presents the refreshed 911 by an impressive as well as entertaining special of the title: 'Even Closer And More Direct - Driven By Precision'. Not only this section of the Porsche website contains various images but also provides a few samples of the car's engine sound. In addition to referrals to the most interesting things in this page, a commentary on the latest revision elucidates Porsche's expertise and policy and makes our article on the 997 complete. Just select below what interests you most. . .
Porsche engines have, thanks to their boxer configuration, a very distinctive running noise. But regulations and technical improvements have exterminated much of the old day's sound. Thanks to a technical dodge, the new Carrera S plays a stunning symphony of combustion noises again. The car maker is proud enough to present this stunning rumble as sound files. Click this link , select 'Experience' and 'Sound' after that. By the way, other Porsche cars can too be heard in a Sound Gallery named page. Get your eardrum stimulated. This is the link: click..! Some things with the new 997 may appear as a surprise, at first sight. Because, the new one looks more like a morph of its own predecessors 996 and 993 than a new car. Additionally, the Carrera S even sounds so. Nonetheless, Stuttgart's supposed step backwards make sense, if the sports car maker's backgrounds are taken into account. Read the article and find out if you would agree with our editor's point of view click..! 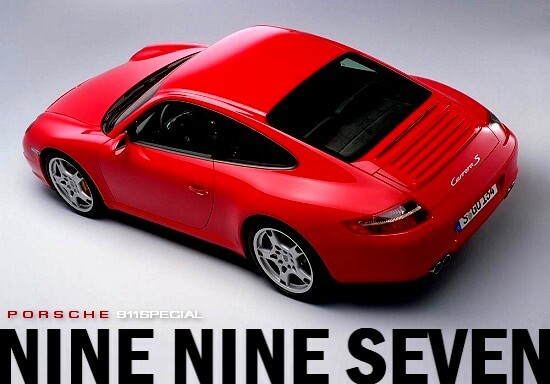 Also pictures and videos of the new 911 are available in the 'Driven By Precision' page. Via 'Experience', a wallpaper section is provided that contains, to our taste, 8 wallpapers even better than the pictures in the official press database. At 'Test Drive', Porsche invites you to experience the driving performance of the new car by video: have a good trip! click..!